ANTI-AGING, HYDRATING, SOOTHING and REPAIRING SERUM. 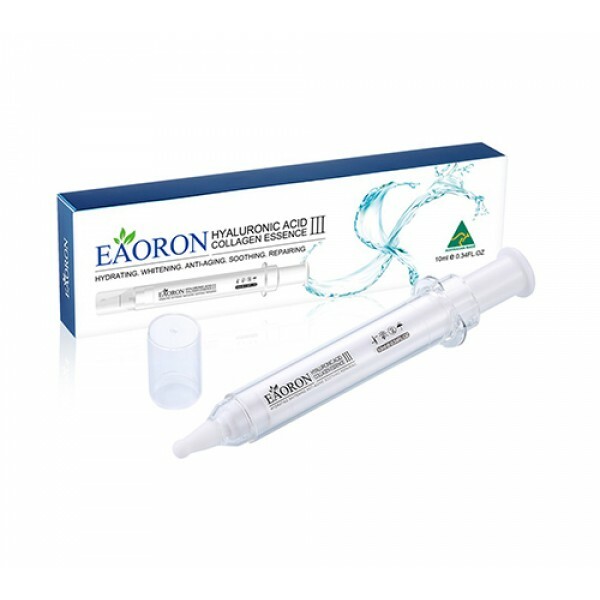 EAORON Hyaluronic Acid Collagen Essence V benefits from the powers of Hyaluronic Acid, CoEnzyme Q10 and Peptides which help to reinforce the skin, regulate hydration and protect the skin from external factors. This supreme essence combines the natural ingredients of botanical oils and plant extracts for youthful, healthier looking skin. The renewing properties of Peptides, anti-aging powers of Hyaluronic Acid and CoEnzyme Q10 help moisturize and soften fine lines. The upgraded formula of Hyaluronic Acid Collagen Essence contains trademarked ingredients Maritech® Bright and Pentavitin®, as well as Dragons Blood extract, which will effectively help with skin hydration, brightening and wrinkle reduction. Purified water,Phenoxyethanol, glycerin, Butylene Glycol, Vitamin B3 Niacinamid, Sodium Hyaluronate, Collagen, Carbomer, Palmitoyl Oligopeptide, Polysorbate 20, Palmitoyl tetrapeptide-7, Lactic Acid, Tea leaf Extract. Bearberry Leaf Extract, Chamomile flower extract, White Mulberry Extract, Witch Hazel leaf extract, Licorice root Extract, Heptapeptide-8, Sodium Starch Octenysuccitate, Coenzyme Q10, Maldodextrin, Natural Vitamin E, Silica, Soya Bean Oil.